PH-200 has one year warranty. Recommended accessories: pH Electrode Storage Solution (PH-STOR) and pH Calibration Buffers (PH-BUF). Note that the meter includes single use packets of the storage solution and a pH 7.0 buffer. This is enough in the beginning, but additional storage solution and calibration buffers will be necessary in the future (exactly when depends on individual usage and needs). The storage solution and pH buffers (while in powder form) do not expire. 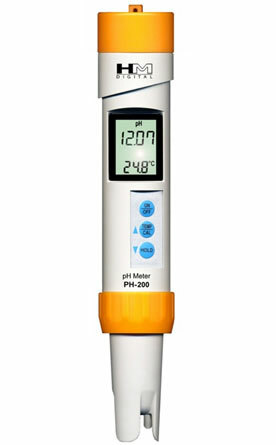 All pH meters should be calibrated anywhere from before every use to at least once a month. The frequency of calibration depends on usage and application, but you should calibrate at least once per month for proper results and a longer lifespan of your meter. A free packet of pH 7.0 buffer is included with the meter. Additional pH buffers for calibration are available for purchase. Please consult the user's guide for calibration instructions. Yes. Nutrients in a hydroponics reservoir will quickly adhere to the sensor and throw off readings. It is very important to rinse the sensor in distilled water after each use. Otherwise, you'll just be measuring the nutrients that are already on the sensor.